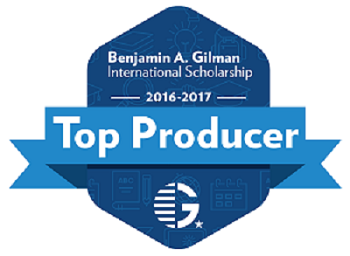 This April, GW’s Office for Study Abroad was recognized by the U.S. Department of State and the Institute for International Education (IIE) as a top producer of Benjamin A. Gilman Scholars. The Gilman Scholarship, which is funded by the U.S. Department of State, helps support students who wish to study for a semester or summer abroad, and are eligible for the Pell Grant. If selected, students can win anywhere from $1,000 to $5,000 towards their time abroad. Almost 10,000 students across the country apply each year. For the 2016 to 2017 academic year, GW’s Office for Study Abroad helped 22 students win the Gilman Scholarship. All together, the 22 GW Gilman Scholars were awarded a total of $85,500 in funding. The story about the Office for Study Abroad’s success with the Gilman Scholarship was also featured in GW Today and Inside Higher Ed . Are you a Pell Grant eligible student and want to learn more about the Gilman Scholarship? Make sure to reach out to Savon Jackson, the Office for Study Abroad scholarship coordinator.